We have just received word from the estate of Mike "Coco" Polakovs that they would like to join us in supporting the International Clown Hall of Fame! Coco's daughter Michelle and his wife Hazel are donating one of their few remaining signed Coco dolls. 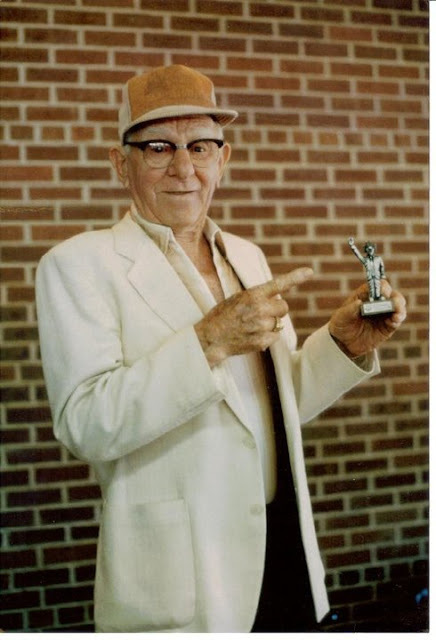 1991 International Clown Hall of Fame inductee Michael Polakov or "Mike Coco", as he is known, achieved fame in England where the family came while he was a youth and his father (also known as Coco) was the longtime star clown of the Bertram Mills Circus. He was associated with the Bertram Mills and Billy Smart Circuses in England, which later included tours of Europe. He came to the U.S. in 1953 to work for a limited time with the Mills Bros. Circus, before returning to England. Coco later returned to the States and joined Ringling Bros. and Barnum & Bailey, working both as a member of the alley as well as spending eight years as Advance Clown and Goodwill Ambassador. He is credited with creating the makeup for Ronald McDonald, touring theme parks with Coco's Musical Comix and continued performing in circuses and acting as an Advance Clown for smaller shows. Coco passed away in 2009. This is one of the very few signed dolls left so we are going to start the bidding at $100. for this doll sent directly to the Hall of Fame from the Polakovs' family collection. The bidding starts now and continues through 11:59 PM (EST) Sunday night. Simply place your bid in the comments section of this post. Word comes to us from artist Angel Contreras (at the Circus Magic convention) that there were only 8 Bill Irwin figurines cast, not 12 like we originally thought. One is on display in the International Hall of Fame, six are in private collections (one being the private collection of Bill Irwin himself) and one could be yours. Next up, Maxwell Frederic Coplan's incredible 1945 photo book, Pink Lemonade. If you've ever seen the classic Ringling Bros. and Barnum & Bailey poster of Lou Jacobs then you are already familiar with the work of Mr. Coplan. The commentary is by circus press agent F. Beverly Kelley, who helped to write Emmett Kelly's autobiography, Clown. Next up we have a Lou Jacobs pewter statue created for his induction in 1998. Mounted on a fine wood base, this very rare and limited statue is a lasting tribute to one of the worlds' most famous clowns! Next item up for bid is a Red Skelton lithograph of a Lou Jacobs-inspired, Native American clown. This item was donated to the International Clown Hall of Fame by Red Skelton himself when he was inducted for future fundraising efforts of the ICHOF. It is a truly beautiful print. The second item up for bid is a resin figurine of Bill Irwin by artist Angel Contreras. This is one of only 12 that were cast and the molds were destroyed so there won't be any more. The original is on display at the Hall of Fame. Bill Irwin was born 11 April 1950, in Santa Monica, California, the oldest of three children born to Horace and Elizabeth Irwin. He was raised in Tulsa, Oklahoma, and Southern California. He spent a year in Belfast, Northern Ireland, as an exchange student. He is a graduate in theatre arts from Oberlin College, OH and a graduate of Ringling Brothers and Barnum & Bailey's Clown College, FL. Mr. Irwin met his wife, Martha Roth, actress-turned-nurse midwife, when he went to her for treatment of a stiff neck. Their son, Santos Patrick Morales Irwin, was born in 1991. Bill was an original member of Kraken, a theatre company directed by Herbert Blau, and was also an original member of the Pickle Family Circus of San Francisco where he worked with Larry Pisoni and Geoff Hoyle. He has appeared as a guest artist with the ODC Dance Company of San Francisco, which first produced his original work. His own pieces, often produced with Doug Skinner and Michael O'Connor, include "Not Quite / New York" , "The Courtroom" and "The Regard of Flight" (PBS, Great Performances). Skinner, Irwin and O'Connor have performed "The Regard of Flight" on and off Broadway, across the U.S. and in Sydney, Australia. "Largely New York", Irwin's original work, was developed at The Seattle Repertory Theater City Center and The Kennedy Center, ran on Broadway, and received five Tony nominations as well as Drama Desk, Outer Critics Circle, and New York Dance and Performance awards. Mr. Irwin performed "Fool Moon" with David Shiner and the Red Clay Ramblers on Broadway, in Los Angeles, Seattle, Vienna and Munich. He appeared at the Public Theater in Beckett's "Texts for Nothing" directed by Joe Chaikin, and as Trinculo in "The Tempest " with Patrick Stewart, directed by George Wolfe (1995), also in "Waiting for Godot" at Lincoln Center with Steve Martin, Robin Williams, and F. Murray Abraham. He adapted, directed, and starred in "Scapin" at The Roundabout Theatre in NYC from Dec 1996 to Mar 1997. At La Jolla Playhouse, he played Galy Gay in Brecht's "A Man's a Man", Medvedenko in "The Sea Gull", and Arlecchino in "Three Cuckholds". He appeared on Broadway in "Accidental Death of an Anarchist" with Jonathan Pryce; "5-6-7-8- . . . Dance!" with Sandy Duncan; and in Philadelphia in "Strike Up the Band" as well as "Waiting for Godot" in Lincoln Center with Steve Martin, Robin Williams and F. Murray Abraham. Bill Irwin has starred in many other Broadway, Off-Broadway, and regional productions, including: "The Goat or Who is Sylvia" opposite Sally Field; "Accidental Death of An Anarchist"; "5-6-7-8 Dance! "; "Waiting For Godot"; "Scapin"; "The Tempest"; "Garden of Earthly Delights"; "Texts for Nothing", and many others. Bill starred on Broadway and London's West End in the revival of "Who's Afraid of Virginia Woolf", for which he won the 2005 Tony Award for Best Actor in a Play. The production had a national tour in 2007. His 2007 theater piece "The Happiness Lecture" was commissioned by and staged for the Philadelphia Theater Company. On TV, he has appeared on "Saturday Night Live," "The Tonight Show," "The Cosby Show," "3rd Rock From the Sun", "CSI: Crime Scene Investigation", "Life on Mars" (US), "Law & Order; SVU", HBO's "Bette Midler, Mondo Beyondo," CBS's "Northern Exposure," PBS's "Great Performances" and, with great pride, on "Sesame Street" in one of his most famous roles, Mr. Noodle. In Britain, he appeared on BBC's "Paul Daniels Magic Show." Irwin has also appeared in many film and television productions, including the PBS Great Performances telecasts "Bill Irwin Clown Prince" and "The Regard of Flight". In his film work, prior to Rachel Getting Married, Irwin appeared in such films as: Popeye, Eight Men Out, How the Grinch Stole Christmas, Igby Goes Down, Lady in the Water, Dark Matter, Raving, Across The Universe and others. Irwin has won many awards, including a National Endowment for the Arts Choreographer's Fellowship, and Guggenheim, Fulbright and MacArthur Fellowships. He gratefully acknowledges these awards. Mr. Irwin is currently appearing on Broadway with David Shiner in the Signature Theater Company production of "Old Hats" as well as the TNT television medical drama "Monday Mornings". Bidding starts at $100. for this extremely rare figurine. 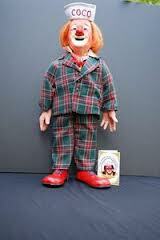 The first item up for bid is a Leon "Buttons" McBryde doll, generously donated by Leon himself. Leon is a graduate of the Ringling Bros. and Barnum & Bailey Clown College, performed with the Greatest Show on Earth and became the first Clown College graduate to become the circus' Advance Clown. He was trained in the job by none other than Michael "Coco" Polakovs. Leon McBryde became a Ringling Bros. and Barnum & Bailey circus clown after graduating from Ringling Bros. and Barnum & Bailey Clown College in 1969. Following his apprentice year with the Blue Unit of the Greatest Show on Earth, was selected as the show's Advance Clown (trained by Michael "Coco" Polakovs) and named Ringling's Goodwill Ambassador. Leon devised many promotional concepts, which he later taught as a Clown College instructor. In 1980 he created the "Ronald McDonald School Safety Show" and the "Big Red Shoe Review"for the McDonald's corporatation and in 1983 began appearing on "Toddlers Friends", a weekly TV show in Chicago, and with wrote and produced 100 segments. Today Leon is known for creating the ProKnows clown noses that virtually all professional clowns wear (as well as other ProFace makeup supplies) and is one of America's premier Santa Clauses. The doll is unsigned and the bidding starts at $40.00 plus shipping.